Modifications to existing MCC, adding sections and or modifying cubicles. Installation of new power management equipment such as MCCs, Distribution panels, Open air substations, Gas insulated substations. Systems will be 400 VAC, 6.6 KVAC, 11KVAC and 33KVAC. Installation of generators less than 2 MW including all electrical interconnections, testing and commissioning but not including generator site preparation, fixing the generator at site and commissioning the generator driver. Installation of lighting systems in production plants. Installations of MV (6.6KV or 11 KV) cables in conjunction with flowline installations. This work will be coordinated with the flowline contractor so that the electrical cable shares the excavation for the flowline. 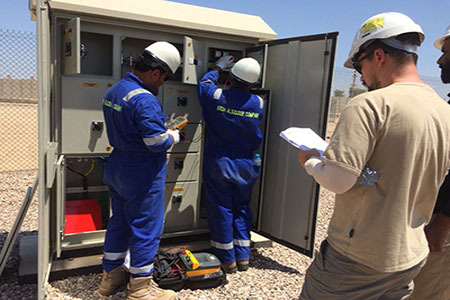 Installations include; stringing and laying the cable, termination of cables, splicing cables, setting and commissioning transformers, any required OHL installations between the underground section and the MV substation. Installation and testing of circuit protection devices. The testing is to be done in conjunction with new installations and will be done on a campaign basis for test installed equipment. Thermal survey of installed equipment. Installing grounding systems and making improvements to existing grounding systems. Termination of cables between existing Control Room Panels and field instrumentation including revising the as-built drawings for the panels. Installation of instrument cables between Junction boxes and instruments utilizing, tray, conduit and cable systems as required. Installation and termination of cables between junction boxes and or control panels including buried cable ways, cable trays and conduit as required. Installation of new instruments including supports, tubing, cabling, calibrating and commissioning. Installing new instrumentation to existing modern PLC control system where provision was made in the original panel design for new instruments to be added. Installation of fiber optic cable (single mode, 24 cores)[SB1] in coordination with the flowline installation contractor between the DGS and the well sites. Provide termination and splicing capability for both single mode and multimode fiber optic cables. Overall one-line diagram(s) of electrical system. Protection and metering one-line diagrams. Installation details (assemblies) as required. Protection relay co-ordination curves/one-lines and setting tables. Lighting plans (indoor and outdoor). Substation drawings (equipment layout plans). Erection works specifications and documentations. Verify interface with other facilities, as required, for tie-ins and integration of new electrical and cathodic protection systems with the above facilities. Provide calculations and studies, as required, to verify and validate that the deliverables produced are complete, accurate, correct and represent a safe and working design. Electrical system studies such as short circuit, load flow motor staring and transient stability shall be carried out. Perform factory inspection of equipment, as required. Developing full design, details, installation specifications, data sheets, drawings for the Temporary Cathodic Protection system, as required by the duty specification, to protect pipelines prior to commissioning of the permanent Cathodic Protection system. performing soil resistivity surveys at ground bed locations. List of groups of variables.